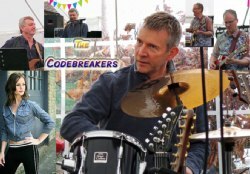 The Codebreakers are a quartet of experienced musicians who play a mixture of original songs and maybe a cover or two. Influenced by such greats as The Beatles and Pink Floyd we can also cite bands such as The Jam, The Stranglers, David Bowie, Jethro Tull, Talking Heads, Squeeze - well, you can see the difficulty in pigeon holing us. Let's just say we play strong rhythmic songs based around a solid electric guitar, bass and drums set up. We have lush 12 string guitar riffs and wonderful soaring guitar solos. We even chuck in some organ and huge synth pads. Some songs will feature acoustic guitar and there might even be a 'fiddle' popping up, although Richard would call it a violin. Charlie, John, Richard and Faye have been together for 5 years. Mainly original music with a Blues/Rock/Pop bent we can also throw in some tasteful covers as well. Suitable for pubs, festivals, mixed audiences.